The best wallpaper apps for iPhone 6 and 6 plus. Beautify your iPhone home screen with these cool iPhone wallpaper apps. Wallpapers are the simplest and most effective way to change the look of your iPhone and turn it into something unique environment. Finding the right wallpaper for your iOS device can be challenging because you want a beautiful picture that won’t get in the way of seeing your icons. The App Store has some cool apps that will make it easy by finding the awesome iPhone wallpapers for you so you don’t need to search through millions of photos. 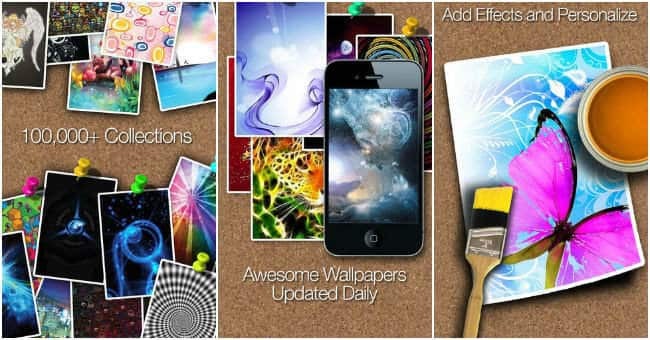 Check out the following FREE wallpaper apps for iPhone below, and make your Apple device look stunning once again. 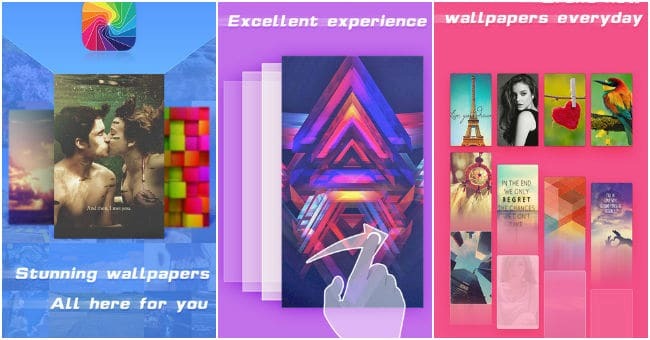 Here are some of the most interesting and best wallpaper apps for iPhone 6 and 6 plus. 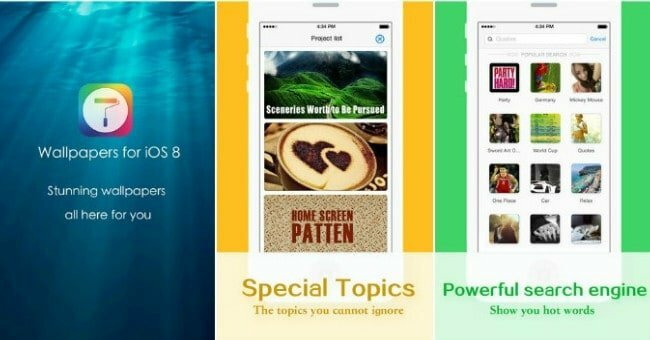 Wallpapers Plus for iOS 8 adds up to 200 new wallpapers to the collection every day with which you can give life to your iPhone 6 and iPhone 6 Plus. The images are in high resolution and also organize it super easy using the filters and options. Wallpapers Plus also has a nice preview animation that lets you see exactly how your wallpaper will appear when the parallax effect in iOS is enabled. You will surely like this free app for iPhone. It is an application that allows you to have more than 10,000 images for the lock screen of your Apple devices. You just have to enter a keyword and the application will offer related results that match the term. The results are varied, sure one fits exactly what you’re looking for. It also lets you view the results of prior without having to apply the changes and lock the phone. This is one of our best wallpaper apps for iPhone 6 not only because it is free, but also for its ease of use and variety of backgrounds. It has a powerful search engine, so you can find your favorite wallpapers easily. In addition, the developer promises to incorporate more than two hundred fresh wallpapers every day and it includes funds style iOS 8. Wallpapers HD is one of the best wallpaper apps for iPhone, iPad and iPod in High Definition (HD). You can find thousands of stunning wallpapers to make your device look cool. All wallpapers are stored as a category manner. Thus, you can find a specific wallpaper easily due to its category wise search. You can share your favorite wallpapers in social networking sites and send trough email. 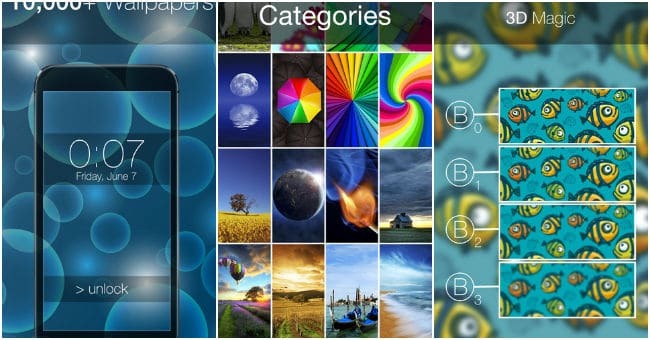 This app provides 600,000 beautiful and fresh wallpapers for your iPhone, iPad devices. With these amazing wallpapers, you can create a unique and awesome look for your iPhone. In each image, you can still put the effects you want and edit them. Every new day you have new pictures and you can see the most popular! These are only a small selection of Best iPhone apps for wallpaper, but there are many others available at App Store. We hope you enjoy the selection. Do you know any better app? Do share your favorite apps: perhaps you may give a good idea to other readers. Thank you.